The upgraded G Series 777 rigid frame off-highway truck carries 98.4 tons with a volume of 83.8 cubic yards. It uses a 916-horsepower Cat C32 ACERT Tier 4-F engine with 7 percent higher torque than the F Series. With seven forward and one reverse speeds, the transmission tops out at 41.7 mph. Operating weight is 363,000 pounds. Auto Neutral Idle allows the transmission to shift to neutral when the truck is idling in a forward gear to avoid stalling the torque converter and increasing engine speed. Engine Idle Shutdown, an operator-selected feature, stops the engine when the truck idles in park for more than a preset interval. Speed Limiting is an alternative to gear-limiting, allowing the truck to travel at a more fuel-efficient engine speed and in a more efficient transmission gear, according to the company. Advanced Productivity Electronic Control Strategy (APECS) transmission controls boost fuel efficiency by maintaining momentum and speed on uphill grades during shifts. Two operating modes, Standard Economy and Adaptive Economy, are designed for fuel efficiency. Standard Economy reduces engine power by 0.5 to 15 percent, based on sites conditions. Adaptive Economy uses a production baseline for the site; then, as the truck travels the haul cycle, the system automatically evaluates the power rating needed to meet baseline requirements. 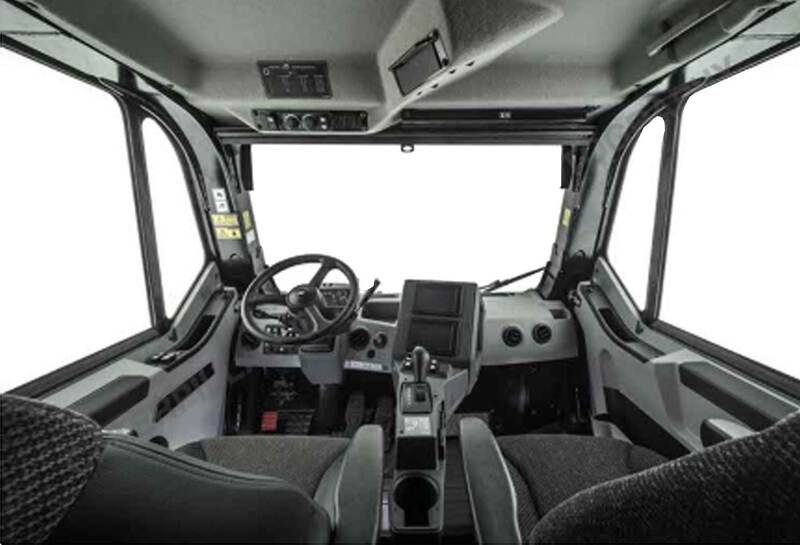 The redesigned cab is easier to enter and exit than the predecessor. The console has an integrated hoist-and-shift lever, and in-cab noise levels have been reduced by 50 percent. Convenience items include a powered left window, automatic temperature control, and throttle lock for long uphill grades. Safety features include laminated glass in the front and left windows, emergency egress via a right-side hinged window, and ground-level engine-shutdown switch. The Dual Slope Body is designed optimize material retention on steep slopes, and carries material low and centered for stability. Heaped capacity is 78.8 cubic yards in its standard configuration. Side-board are available to increase capacity for lighter weight materials. The X body has a flat floor and facilitates metering material into a crusher; standard heaped capacity is 83.8 cubic yards.